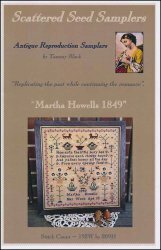 Martha Howells 1849 [W5213] - $14.00 : Yarn Tree, Your wholesale source for cross stitch supplies. Cross stitch pattern by Scattered Seed Samplers. An antique reproduction with the verse, "How doth the little busy bee Improve each shining hours And gather honey all the day From every opening flow'rs". Accented with flowers, dogs, birds, and bees. Surrounded by a floral vine border . Stitch count 192w x 209h.